The transition from a hunter-gather lifestyle to a lifestyle of agriculture was foundational in the development of society as we know it. It fostered exponential growth in the division of labor and ultimately a free market in which to trade goods. The free market was an astounding evolution and continues to be the only system of resource allocation capable of creating magnitudes of wealth while simultaneously meeting human needs. But, civilization came at a cost. Modes of existence were adopted that are in opposition to human nature. The unintended consequences of an agricultural lifestyle were the development of hierarchical societies, the maltreatment of children and the eroded health of the population. Nothing worth having is free, but sometimes we don’t know how much we paid. In order to fully understand why our modern agricultural world is not congruent with our nature it is helpful to begin by understanding why agriculture evolved and how it spawned hierarchical societies and government. There are several theories as to the reasons for the rise of agriculture, but what seems to be the most plausible is that an increase in population densities combined with a change in climate planted the seeds (literally and figuratively) for agriculture (see Guns, Germs and Steel by Jared Diamond). 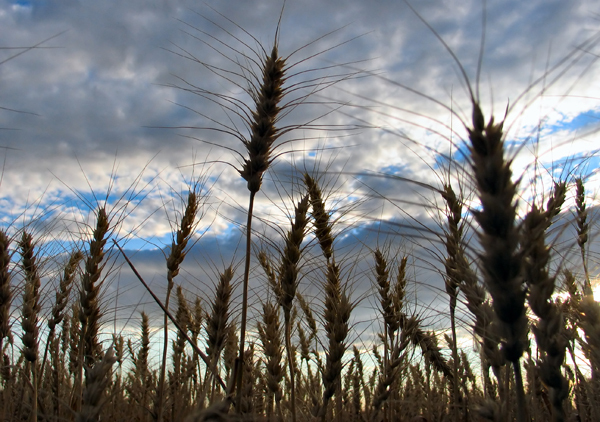 As populations increased, staple foods began to decline due to resource depletion. The diminishing food supply coincided with a climate change that fostered a growth in wild grains, which previously had not been plentiful. The end of the Paleolithic Era, which spanned from 2.6 million to 10,000 years ago, brought about the last ice age. The climate change led to longer dry seasons, which favored wild grains that stored their energy in seeds as a way to lie dormant and survive arid times. The new abundance of grains led to their adoption as a staple food source, and hence, the evolution of agriculture. This transition of staple food sources led to one of the most significant technological advances of our species, the birth of agriculture-based societies. The egalitarian social structures in which we evolved were the result of human adaptations to the environment. A combination of human nature and strong social norms were responsible for the ability of hunter-gatherers to have maintained their egalitarian societies for hundreds of thousands of years. It was during this time that the rational self-interest, which defines us as human, was formed. An understanding of reciprocity and a need for autonomy also developed during this time, fostering our ability to thrive. These adaptations were in response to the fact that our food sources were highly perishable and geographically speaking, easily depleted. Game meat, fruits, vegetables and nuts have a short shelf life. Therefore hunter-gatherers could not keep stores of food and did not have to concern themselves with protecting it. On the contrary, if an individual within the band had a surplus of food it was given to other band members. This gifting was a form of insurance to engender good will and reciprocity in the future when the donor was himself in need. It was an ingenious way to further self-interest in a time when there was no way of storing values for the future. In fact this practice became so vital for survival that we formed an innate predisposition to understand and participate in reciprocal trade. The food sources hunter-gatherers fed on, or which their game fed on, were easily depleted in the specific areas of their encampments. This necessitated a nomadic lifestyle in order to follow the food. This mobility allowed them the ability to avoid any neighboring tribes that may be aggressive or exploitive towards them. The autonomy of the group was mirrored in the autonomy of its members. A small number of individuals could leave the group and form a new band if they felt they were being exploited by others in the group. An aversion to coercion and an adaptation to autonomy emerged because freedom from coercion meant freedom to satisfy basic needs. As humans we have an innate desire to be free because it allows us the ability to meet our needs and thrive. There were strong social norms which kept the division of labor minimized to ensure that each person could remain autonomous, but still contribute to the tribe. In a time when acquiring food on a daily basis was a major priority and required large expenditures of effort it was adaptive to not have too much specialization. More individuals hunting and more individuals gathering increased the odds of finding food. Hunter-gatherers also used social norms to mitigate dominance of the more powerful members of the tribe by a system of humbling. If a powerful hunter brought back a big kill it was disparaged by the group. It was taboo to be boastful and in fact the hunter was also expected to disparage his kill. If this social norm was ignored the arrogance was thwarted by ostracism. These social norms reduced the incentive and opportunity for oppression. It was under these conditions that we evolved as rationally self-interested, autonomous beings with an innate understanding of reciprocity. These are aspects of our human nature which we retain to this day. Small band hunter-gatherers, while not the noble savages of mythic lore, had lower rates of violence than their farming counterparts. An agriculturally based lifestyle brought with it the breakup of more egalitarian social structures, as it made violence a more viable alternative. A new set of challenges emerged when our ancestors began to grow their own food and the solutions which were adopted changed the egalitarian dynamics of hunter-gatherer society. Agriculture allows for the stockpiling of food and thus the need to protect it. It requires land and a sedentary population. It fosters division of labor and population growth. To deal with these novel challenges, hierarchical society and governments were formed. Once grains were incorporated as a food staple, the ability to have stores of food presented the need of protecting it from other tribes. An agricultural village with a store of food could be an inviting target for a neighboring village down on their luck. This new enticement served as an incentive for predation to those who were inclined to use violence to meet their needs. The initiation of violence is the result of choosing an expedient way to satisfy some needs in the short term at the expense of other needs in the long term and is obviously not conducive to the well-being of those subjected to it. A plot of arable land and a large amount of labor were needed to prepare the soil for crops. Due to this investment, coupled with the fact that grains were becoming a primary food source, the cost of leaving cultivated land became much more onerous. This incentivized the population to be sedentary which in turn made them easier to exploit by outside groups. Crops are also uniform which makes them easily valued and taxed, a fact that would come in handy for the governments that followed. The division of labor and increases in population, which are the byproducts of agricultural societies, worked in tandem to reduce individual independence. Agriculture increased in importance as traditional hunter-gatherer food sources became scarcer and it allowed for more nutrients to be derived from the land on a per acre basis which led to population increases. The division of labor quickly became a critical factor in maintaining a consistent food supply as fields increased to feed an ever expanding population. This specialization caused individuals to lose the necessary skills enabling them to survive on their own, thus it was more difficult to leave the group if they were being exploited. In fact, since specialized roles were now needed to maintain a consistent food supply a hierarchical structure was deemed an expedient means of insuring there were no disruptions. Hunter-gatherers did not have the tools readily available to ward off violence in this new social dynamic. Once they became a larger, sedentary population dependent on the division of labor and food stores, they found themselves vulnerable to predation both intragroup and intergroup. The type of future society they were laying the groundwork for had not yet arrived. Still to come was a large society with a market based economy and the trade engendered between parties both intragroup and intergroup which acts a natural deterrent to violence. You are much less likely to kill people with whom you are dependent on trade. A free market, along with the critical innovation of money, allows for a store of capital and incentivizes the division of labor. This allows a society to move beyond mere subsistence, which is critical, as unmet subsistence needs have explosively violent potential. Fledgling agriculturalist didn’t have the benefit of these mechanisms and resorted to hierarchy to meet their needs for safety. As conflict increased, the social norms changed, allowing for the dominant members within a group to assert power in the name of protection. A dominant leader was seen as beneficial in order to settle disputes and create cohesion in the event of attack. Thus we embarked on the rocky road of oppression that has led to modern statism. Hierarchical social structures, enforced by violence, are against our human nature and therefore, irrational. To act irrationally in a rational universe creates anxiety in us and decreases the ability for the individual to thrive. We evolved to be rationally self-interested and autonomous beings capable of understanding the intricacies of interpersonal interaction, which facilitate reciprocal cooperative societies. The use of force to maintain a hierarchical society under the guise of protecting us from the threat of force by a third party is a cure worse than the problem it ostensibly solves. The irrational use of violence to meet needs may be a viable short-term survival strategy, but it is a long-term recipe for disaster. If it is embarked upon by an individual it creates a myriad of unnecessary risks. If it is instituted by a society it culminates with the enslavement of the population. A vacuum of order was created by the rise of agriculture as the factors that had mitigated violence within the societies of hunter-gatherers were eliminated. The exercise of power and threat of violence filled the void in the form of hierarchical social structures. However, order was instituted at the cost of long-term human well-being and sadly little has changed to this day. Even though we now possess the tools for egalitarian social structures in the era of agriculture, we have been unable to wrest our freedom from dominance-based hierarchy. Agriculture necessarily evolved before the advent of the free market. But now that a market has evolved, which serves our rational self-interest; it can be implemented as a tool to move beyond tyranny. This entry was posted in Parenting, Philosophy and tagged agriculture, Attachment Parenting, happiness, human nature, human survival, human well-being, hunter-gatherers, philosophy and ethics by Scott Byars. Bookmark the permalink.